A great buy, the Cambridge has a medium firm feel while providing firm support – excellent for the lumbar region of the back. A great buy, the Cambridge has a medium firm feel while providing firm support – excellent for the lumbar region of the back. 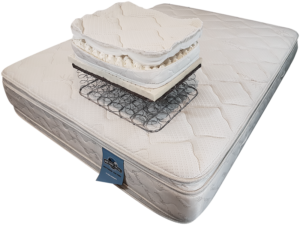 The softness is provided through the plush pillow top while the firmness is delivered via a firm foam topper and a quality Bonnell innerspring. You’ll experience reduced transfer of motion – great for those who are more active during the night. The firm foundation provides additional support for both you and the mattress adding extra value from start to finish. For those who prefer an innerspring free sleeping surface, this 7”, 100% natural rubber mattress is a solid choice. If you’re a side sleeper looking for both comfort and durability, look no further. Calling all side sleepers – the Holland Maid mattress is for you.